Hong Kong – President Xi Jinping opened the long-delayed and over-budget Hong Kong-Zhuhai-Macau Bridge on Tuesday, billed as a major step forward in China’s plan to turn the Pearl River Delta into a technology hub to rival Silicon Valley. 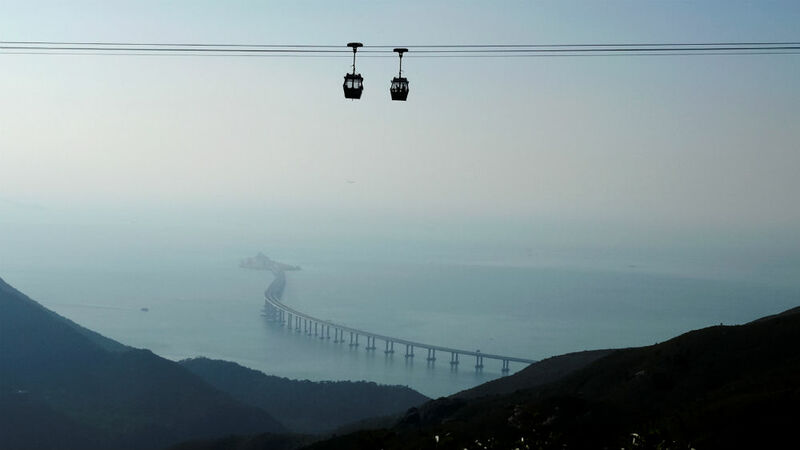 But critics worry the 55km-long bridge connecting the mainland city of Zhuhai with the semi-autonomous territories of Hong Kong and Macau is as much about politics as it is business. China is stepping up initiatives to increase trade across the region and at home – the opening of the mega-bridge comes a month after a new high speed rail link started carrying passengers from Hong Kong to the mainland. The government in Beijing and authorities in Hong Kong and Macau, which have funded the bridge together, say it will meet the demand of both freight and passenger traffic, and boost economic development within the cities of the Greater Bay Area, which are home to an estimated 69 million people. The bridge “will facilitate personnel exchange, and bring strategic significance for the development of both Hong Kong and the Bay Area”, Frank Chan Fan, Hong Kong’s secretary for transport and housing, said in a statement. “The challenge is to make sure that the separate systems of Hong Kong and China are preserved as the two countries implement institutional reforms,” said Jiang Lin, an economics professor at Sun Yat Sen University. The Greater Bay Area, first mooted in 2017, is supposed to turn the region from a global manufacturing hub into a centre for innovation in science and technology. Although concerns are growing about a China-US trade war, a survey from KPMG China, HSBC and the Hong Kong General Chamber of Commerce released earlier this month found businesses broadly supportive of the Bay Area plan, although 68 percent were concerned about regulatory ambiguity. Policy coordination and the movement of capital were also seen as challenges among the executives surveyed. Kow Ping, CEO of Hong Kong medical start-up Wellbeing Digital, is among those who see the bridge as a step forward – for both Hong Kong and the wider region. Wellbeing Digital, which started business in 2013 in Hong Kong’s Science Park , now holds 28 patents and has filed for 52. The bridge will shorten the driving time from Hong Kong International Airport to Zhuhai from four hours to just 45 minutes, as well as halving the commuting time between the ports. Bus services along the six-lane highway are also expected to offer a more frequent service than the Hong Kong-Macau ferry. Construction on the bridge started nine years ago, and the project was supposed to be completed by 2016. The delays – related to road construction in Hong Kong and the territory’s environmental standards – have helped inflate costs. The last estimate of $2.2bn was released in January. In Tai O, a traditional fishing village in Hong Kong, tourists head out into the bay in the hope of catching a glimpse of rare Chinese White Dolphin. But the scale of the project, which skirts around Hong Kong’s international airport and involves three cable sea bridges, one undersea tunnel, and two artificial islands, has raised concern about the bridge’s impact on the delicate ecosystems of the Pearl River Delta. Day-trippers are guaranteed a sighting of the world’s longest sea bridge, but the dolphins are increasingly hard to find. “North Lantau, where the bridge connects, is the main natural habitat for these dolphins,” said Roy Tam Hoi Pong, who heads the Hong Kong environmental group Green Sense. Tuesday’s opening has taken many by surprise. Transport operators in Hong Kong expected to have about two months to prepare and were taken aback to discover last week it would be open to the public starting Wednesday. The South China Morning Post, citing a government source, said the late notice was a security precaution. 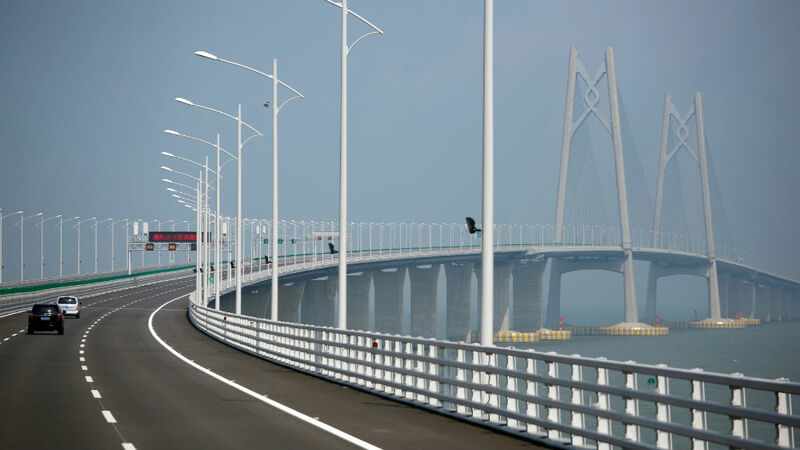 Xi opened the bridge on a site near Zhuhai, and was not expected to travel to either Hong Kong or Macau. In recent weeks, China’s promise of “one country, two systems” in Hong Kong has come under increasing strain. Earlier this month the Hong Kong National Party, which promoted independence from China, was outlawed and the president of the Foreign Correspondents Club denied a visa after chairing a discussion with the party’s leader there. Hong Kong authorities have not revealed their reasons for denying the visa. Financial Secretary Paul Chan Mo recently urged Hong Kong’s young people to consider taking advantage of closer ties to set up home in other – cheaper – parts of the Greater Bay Area. But a recent report by a pro-Beijing group, the Hong Kong Youth Power Association, found more than half of 878 people interviewed would not consider such a move.